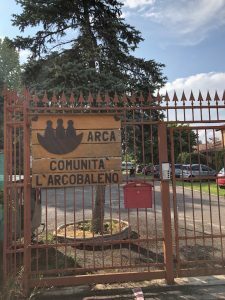 There is so much I want to say about my experience at the L’Arche community in Bologna, Italy but I will never be able to describe the reality of my experience or fully express the appreciation, gratitude, and love I have for it. First and foremost, I would like to thank God for calling me to serve and leading me to L’Arcobaleno. Before applying and after getting accepted, there were so many times when I was so nervous and unsure about going. Two months, in a city I’ve never heard of, in a community where I didn’t know anyone (not even my co-volunteer from UP), working with groups of people I haven’t really had much experience working with before, and expected to speak a language I’ve never learned, I was terrified. But regardless of all these factors, I knew I really wanted to do this. Not just because it was an excuse to go back to Europe, or solely because of my interest in learning more about and working with intellectually disabled peoples, but because something bigger and unknown kept drawing me to go, to not worry, and to trust in God. Fast forward to one month in and I was already devastated that I had only one month left. Then the next thing I know, my time came to an end on the 22nd of May, the last month going by in a blink of an eye. And now, it has been over two months since I left Arca and I miss the community and the life I had so dearly. There are so many things I have come to love about living in community with the ragazzi, or core members. Life was simple. We woke up, ate breakfast together, went to morning greeting and prayer together, participated in some kind of morning activity together (such as physical therapy, art, music, etc. ), ate lunch together, took breaks, helped prepare food or the dining table together, ate dinner together, cleaned up together, and then prayed together before going to bed. The house where I was assigned to workr, Cedro, we loved to listen to dance music so a lot of times we would even dance together. Also, before and after every meal, we would sing songs of grace together. Even though this lifestyle sounds mundane or monotonous, I enjoyed every bit of it because I got to share it with some truly amazing people. Everyone had their own pasts, stories, differences, and quirks but we all lived together humbly and enjoyed each other’s presence. The simplicity of our routine made it easier to understand and get to know the ragazzi better. From their seats at the table, to their preferences of music, to what exercises they had to perform during physical therapy, and observing their little quirks, we had come to know them and use these observations to help strengthen our relationships with them. It was a constant struggle not being able to fully communicate with them, but regardless of the language barrier, we were able to build genuine relationships. Through lots of nonverbal communication, being able to anticipate specific needs after some observation, and just merely being present, we became friends and family with these core members, and that was priceless. During our second week at Arca, we went out for gelato with a few assistants and other volunteers. While we were all getting to know each other, we would also talk a lot about the ragazzi. One assistant made a comment about the ragazzi that resonated with me since and he said, “they are just like us”. That was the biggest lesson that I learned while living life with these disabled adults is that in many ways, we are the same. We all have our good and bad days, our stories that makes us who we are, our vulnerabilities, our weird quirks, some sass and attitude, our own preferences, and most importantly, our yearn to love and to be loved. 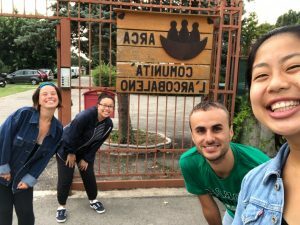 Overall, I made the best decision of my life to spend my summer at Arca in Bologna. My experience was very eye-opening and life changing to say the least. It gave me a chance to be completely immersed into Italy’s beautiful culture, the opportunity to get out of my comfort zone, to be able to live and work with disabled adults, to learn a new language, to eat Italian food every single day, to have time and space to grow and reflect, to build meaningful relationships, and to be a part of something bigger than you. I was so lucky to have been given this opportunity through UP’s Moreau Center and L’Arche. I also could not have done it without the constant support from my friends and family. Now, I am back at UP and not a day goes by without missing the Arcobaleno community or wishing I was back in Bologna. But being in the present, I hope that as I go through my clinical experiences as a nursing student and building community in my dorm as an RA, I can reflect the love and patience I have received at Arca. The other week, I had the privilege of celebrating my 20th birthday here at Arca Bologna. Right when I woke up and walked into the kitchen, I was sung to by the core members of Cedro. Throughout the day, I felt so loved by the community with every greeting and hug I received. I was blessed to have had a homemade pizza and cake for my birthday dinner made by my family here in Cedro. And to top it off, I was given a birthday card signed by all the members of Cedro and a tortellini magnet that has Bologna written on it. I did not expect anything at all for my birthday here and I thought I would be sad not being able to spend it with my family back home, but in reality I was not sad at all! My heart was filled with so much love given to me by the family I have come to make here. With less than 2 weeks left, I can speak for the both of us that we are getting really emotional thinking about leaving our home here. I am so touched by the people here who have welcomed us and showed us patience and compassion every single day. God has truly blessed me with this opportunity and I am so grateful for ending my teen years and starting my twenties with the most loving community. Three weeks have passed since our first day here and I can easily speak for the both of us that time is flying by so quickly! At first, the days seemed to go by extremely slow. I felt bored just sitting around not doing anything, waiting for the next meal or activity. When minutes felt like hours, in my head I constantly thought, what am I doing? Why am I here? How is sitting here benefiting me or the community members? I questioned the purpose of my position. As a volunteer, I initially thought that I should be helping clean, cook, or do some sort of physical work instead of just sitting around doing nothing. It wasn’t until a fellow volunteer gave me some advice when I better understood my purpose. He told me that we don’t need to be doing something every second, that our job is not only to do chores but it’s more so to spend time with the community members. That advice changed my perspective and attitude when sitting with the community members. 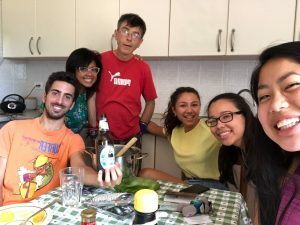 Even though I can’t speak much italian with the community members, sitting with them is not doing nothing, but it is being present with them, enjoying each other’s company, and sharing a common experience. I realized this opportunity I have right now isn’t like most volunteer experiences I’ve had in the past. 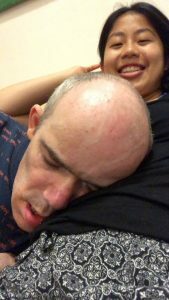 L’Arche is so unique because we are living in community with intellectually disabled peoples. And living in community with people can be very similar to community living, such as dorms or even our own homes, where everyone contributes to the running of the house or building, and we do almost everything together. With this new knowledge, I now know that my job here is to be just another member of the house, to eat, to relax, to dance, to pray, to clean, and to participate as the other community members do, even when that involves sitting around. As week four comes to a start, days seem to be going by much quicker, days are more routine, relationships with community members, other volunteers, and assistants are growing stronger, and every day challenges are getting a lot easier to overcome. I can say with much confidence that I am loving it here and I do not regret coming here one bit! 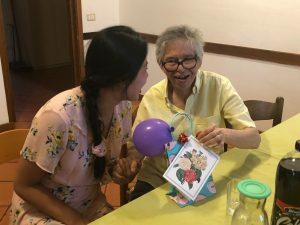 During this past week, there was a big celebration in the town of Quarto Inferiore, where L’Arche Bologna is located just about 20 minutes outside of Bologna. The fest, Quarto di Luna, included specific events every day. Two events that we participated in as a community was the parade and the Open Day. For the parade, the L’Arche community formed a marching band. 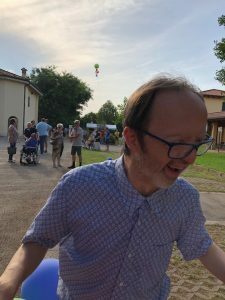 I had the pleasure of representing L’Arche Bologna by marching along the main street of Quarto Inferiore with my new community, loud and proud, banging on cow bells. 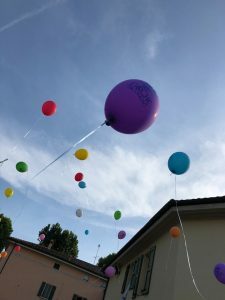 The following day, L’Arche Bologna hosted an Open Day where we opened the gates to anyone in the town to come check out the community to get to know the members, eat some cake, watch performances, play with chickens and turtles, dance, and release balloons into the sky! It was a busy week preparing for and participating in the festivity but it sure was a lot of fun! When I first applied for this L’Arche Bologna program, I didn’t have much of an idea on what I was putting myself into. The posters in Mehling caught my attention since freshman year, but I was never sure if I was capable of the challenge. Freshman year I didn’t apply, but this year I did. 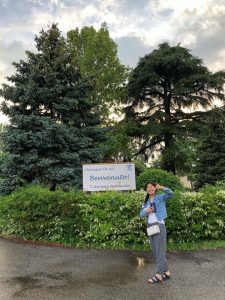 After studying abroad for a semester in Salzburg, Austria and experiencing L’Arche at UP, I thought it wouldn’t be so out of my comfort zone as it seemed before. Leading up to my departure, there was never a point where I was certain of what was to come or if I was sure of myself in following through. Hearing the experiences of those who went before me sounded inspiring and informative but also left me with a lot of uncertainty. I have never learned italian before and I have never worked with disabled adults before L’Arche at UP, which I only participated in a total of 3 times. However, I knew I wanted to do something meaningful with my last free summer. Even though I wanted to work and earn money, especially after studying abroad, I remembered how unhappy I was last summer nannying 9hrs/day, 4days/week. I complained about the kids I nannied, the pay I wasn’t getting enough of, the gas I had to pay for, and dealing with traffic just to get anywhere. So when I reflected on L’Arche Bologna after getting accepted, I knew this would be a great opportunity for me. It was a chance for me to get out of the hustle and bustle back home and take a step back to not stress about money, traffic, or making plans with friends to make my social media account look like it’s filled with fun summer activities. Rather, I could focus on building relationships which is something I love to do. I look forward to learning from my interactions and relationships with the community members on how to be present. A few days before arriving in Bologna, my mom and I traveled to Barcelona and Rome. In Rome, we ran into some crazy experiences. Quick side note, I’m the kind of person that believes in fate, karma, and signs for almost everything in my life. That is my way of understanding God’s plan for me and how he works in mysterious ways. Anyways, in Rome, we arrived in the afternoon knowing we missed the big Pentecost Mass in St. Peter’s Square and the papal blessing which I was wanting to attend but couldn’t because of our schedule of transportation. But after we arrived, we entered the Basilica that evening, which was a blessing itself to be there, and we got to attend a small evening mass inside the front portion of the St Peter’s Basilica. I thought, how lucky am I to be here at the right place at the right time? It must mean a good sign in order to have God bring me here before going to L’Arche Bologna. However the following day, my mom got pickpocketed on the metro and lost the cash she was leaving me for my spending money during my stay in Europe. I thought, how unlucky were we to have a handful of cash stolen. It must be a bad sign, which made me second guess my luck for the next two months here in Italy. But later that day, we were lost trying to figure out which bus to take to the Trevi Fountain and luckily, a Franciscan priest noticed we were lost and offered his help. He guided us the way because he was fortunately going near the fountain. 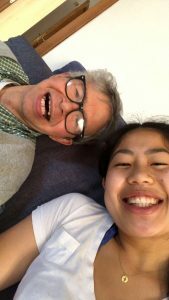 When I told him why I was visiting Italy and told him about L’Arche, his face lit up! He was so happy to hear that I was doing volunteering for L’Arche and fulfilling God’s work. When saying goodbye, he blessed me and offered his prayers. After a strange sequence of events in less than 24 hours, I tried to process everything that happened and what it meant. I came to a conclusion that even though I had something bad happen to me, the good overcame the bad and I learned a lesson. And whether it was a sign of good or bad luck, I think the events prepared me with the mindset that my experience here won’t be easy breezy. I’m going to have bad days where I might question ehy I’m here. But I’m also going to have some amazing days that will be the token of my summer. Regardless, God will guide me and assure me that I will take away new knowledge and appreciation. Finally the day has come, and we arrived in Bologna. Daniela picked my mom and I up from the train station and welcomed us into the community. For our last evening together, my mom wanted to eat out around the community and get familiar with the area. We stumble upon this pizza place which is super small but was so delicious! As we were eating our scrumptious pizza, we were watching the small tv in the restaurant on a show about traveling and tasting different teas in Asian countries. Then all of a sudden, my hometown, Shizuoka, which is also home to amazing green tea, came on the screen. What a coincidence that I was here, in this tiny pizzeria just outside Bologna, and my hometown appears on tv? Thinking about all these random experiences that had happened in such a short amount of time upon my arrival in L’Arche Bologna (again), I believe it must’ve been weird messages from God telling me it’s going to be just fine here, that I’m supposed to be here. Now that’s it’s been a few days here, I am adjusting and adapting to a different agenda, language, culture, food, and life in general. It’s been difficult mostly because of the language barrier and not really knowing what we should be doing. But, it’s really nice to have Asia with me knowing that we are both going through the same thing. I have lots of questions, and mosquito bites, but I also have a lot more peace and laughter here as well. One thing I have already come to love is how every morning during the weekdays, the entire community gathers together to pray, share announcements, and to pass a bell around to say “buongiorno” and their name to every single member. It is currently a struggle memorizing everyone’s names and just comprehending their Italian, but nonetheless I’m thrilled to be here. I’m so happy to see what’s to come these next two months! 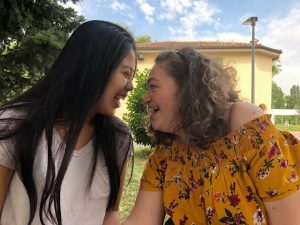 As Asia and Julia embark on their journey to L’Arche Bologna, I wanted to reflect on an idea that Jean Vanier, founder of L’Arche, speaks about often in his writing. ‘The first call’ is a moment when people start the journey towards wholeness, of becoming more in touch with one’s own being by being with others. He goes on by saying, “The call [to community] is an invitation: come with me. It is an invitation not primarily to generosity, but to meeting in love. Then the person meets others who are called and they live together in community.” Julia and Asia have been brave enough to step into this first call with curiosity, excitement and openness. I look forward to hearing all they encounter in Bologna, with and among others, who are also so called to meet together, in community and in love. Good luck, safe travels and many blessings on your way Julia and Asia!! Quote from Jean Vanier’s “Community and Growth,” p. 71 (revised edition). 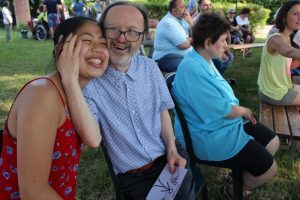 As I approach the last week of my journey I wanted to share about two topics that have impacted me and my time at L’Arche. The first is the language barrier. I came to L’Arche knowing little Italian. (I thought “ciao” was spelled “chow”. Very wrong I quickly learned!) Luckily, Spanish is very close to Italian, but they are definitely NOT the same. I took Spanish classes throughout high school and my father grew up in Mexico, so I grew up hearing Spanish being spoken. By knowing some Spanish, I started off being able to understand the topic of the conversation but not all of the words and what people were saying. Often when I do not know a word in Italian I can try in Spanish and sometimes it is similar enough that the assistants understand what I am saying! 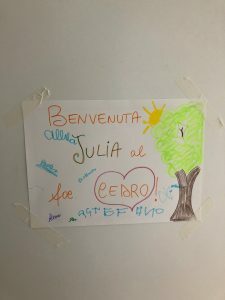 As my time at L’Arche progressed, my Italian improved tremendously. I can now speak much better and know many words. Each day I try to learn a word that I can use in conversations with the rigazzi (residents) for everyday L’Arche life. Today I learned how to say “Set the table.” As I learn to speak more Italian, my comprehension has grown as well. I can now understand much more in conversations and when others want to tell me things they can do so in Italian. Also I can understand what the rigazzi say to me and can respond to a certain extent. The language barrier has been not only tricky for me, but also for the assistants and rigazzi. It has been interesting with the assistants because the assistants fall into 3 main categories in terms of communicating with me. The first is the assistants that speak English. In my house there are 3 assistants who are fluent in English and are very easy to communicate with. One assistant tries to tell me in Italian and if I do not understand she will then tell me in English. One assistant even told me, “speak English with me only, I enjoy getting to practice and keep up my English.” The second category is the assistants who do not speak English but still try to communicate with me. There are quite a few who know zero English but they still try to have conversations with me and try to get to know me and include me in everyday conversations. I really appreciate their efforts to try to get me to learn Italian and treat me as if I knew how to speak Italian. The third category is the assistants who do not speak English, but also do not try to communicate with me because they simply do not want to work around the language barrier. This group is very small and not many assistants fall into this category. But there have been a few assistants who merely ignore you because they just don’t even want to try. I responded to an assistant when she didn’t think I understood what she said, and it changed her outlook. She began trying with me more and wanting to help me. This meant a lot to me because I felt like I had helped her realize that I want to learn and it doesn’t matter that I am not fluent in Italian. The rigazzi are all different in how they respond to my Italian. A few of the rigazzi are extremely helpful and I ask them what things are and they help me learn new words. One rigazzi even taught me how to count to ten with correct pronunciation. But some rigazzi sometimes do not understand me fully and give me a “huh?” look. There is one rigazzi who does not like my poor Italian and tells me “Basta” which means stop or enough when I pronounce the word wrong or say words out of order. So I try to have my Italian at its best when I am around this rigazzi and am sensitive to his feeling about my Italian. There is one rigazzi in my house that does not talk and does not verbally communicate, and does not respond to any words in Italian. When I am alone with him I practice my Italian with him by saying it aloud and just try to talk as best as I can. He does not respond to any words so it is a nice time for me to practice with him. The second thing I wanted to describe is communication with the rigazzi. Not all communication and relationships with the rigazzi are ones where I talk to them. All the relationships with the rigazzi are different which makes them special to me. For example, in the morning when we go to the saloon to say good morning to everyone, there is a rigazzi who lives in a different house than mine that says “ciao” to me and then invites me to sit next to him. When I see him I fix his shoes and realign the velcro. After that I give him a short back rub and then we are done. He does not like to talk much to anyone. But that little everyday communication where I fix his shoes and sit next to him is our friendship. It is interesting how each rigazzi wants you to be their friend in different ways and how they interact with you. With one week left, I will continue my relationships and build on my Italian, but I will also have a hard goodbye.